What is Azis? He’s a Gypsy chalga singer. And then some. Check it: nothing (and no one) else in Bulgaria has quite so brazenly rejected the numbing greyness of official Bulgarian ‘culture’, one so long proscribed. Not that Azis is a political activist. Indeed, I doubt if older he would have actively opposed Zhivkov’s regime. Laughed at it? Sure. Winked at it too: I imagine he appreciates a man in uniform. Initially Azis resembled a chubby, youthful Andre Agassi (big hair & stubble) and was viewed as just another Gypsy chalga singer, albeit one with a beguiling vocal style, his voice pitched high and keening. His metamorphosis into the most controversial entertainer in Bulgarian history involved a daemonic appearance shift and videos so lurid, so hallucinated with desire, they leave efforts by The Prodigy and Marilyn Manson gathering MTV dust. 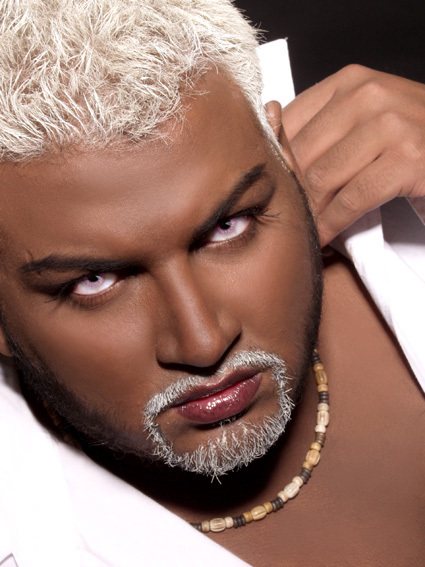 For the AZIS 2002 album he was appearing in saris and belly dance costumes, high heels on his feet, bleach in his hair, chest and armpits shaved. As were melodies from Greek, Serbian, Turkish, Egyptian and Bollywood songs, Azis adding lyrics (in Bulgarian and Romani) and a twisted eroticism: the beefy Gypsy boy transgressed into a symbol of the new Balkan night. Krum then plays the new Azis video for Nikoi Ne Mozhe (Nobody Cares). The clip begins in silence. Sitting in a nightclub a Body Builder and his female companion stare into one another’s eyes. Then Azis enters and BB’s eyes are all over Azis. Who pays no attention. BB rises. Girl tries to hold him back. BB rushes to touch Azis. Bodyguards pound BB. Girl screams. Cut to Azis in a spangly Hindu Love God outfit and outrageously fake fingernails standing in a fountain surrounded by white swans. He’s wailing Bollywood style. Cut to Azis and Body Builder bonding on pink satin sheets. Swans. Satin. Manly hugs. It goes on like this until the song finishes and the video cuts back to the nightclub’s silence. Azis enters the toilets where discarded amongst the urinals is BB with a needle hanging out of his arm. Azis brushes a tear away. Fini. As a performer Azis is one of those rare artists who’s beyond embarrassment, no matter how tacky or kitsch his efforts. Krum asks: what do I make of the video? Uh, well, more fun than Trainspotting. The video was shot in O’Azis, the Sofia club Azis owns, says Krum. Boy’s done well. And then the boy is in the room. Smiling, eyes twinkling (beautiful eyes), gossiping and giggly about his TV appearance, checking me out, puffing on a cigarette, wearing leather pants, black T-shirt, denim jacket, eye liner, tattooed neck. First impressions: he’s big for a Gypsy, tall, huge thighs, strong shoulders, already carrying the belly that signals success on the Indian subcontinent. And dark, caramel skin glowing. The baleful Azis has been left on set, today he’s more Liberace than Lucifer, his aura one of intrigue, mischief, of . . . Little Richard. Their impish sense of outrage, camp affectations, ability to blend musical forms and camp affectations suggest spiritual kin: Azis’ chants and yearning wail as distinctive as Little Richard’s shrieks and roaring “AWOPBOPALOOBOP ALOPBAMBOOM”. Introductions are made. Azis starts to talk.